The sudden appearance of working class resistance to the war effort in central Serbia in late May should be an inspiration to proletarians in all the war-affected countries. In the immediate term it probably won’t be, but we owe it to our class brothers and sisters in this region to spread the spirit of their struggle as best we can. The conscript soldiers who deserted, their relatives and other proletarians who have physically attacked the media and local government (and even the occasional general!) showed an admirable lack of patriotism, a real spirit of defeatism - they showed that they literally didn’t care if “their” country was invaded by foreign troops. They didn't merely quibble about the rate of killings but stated loudly and clearly that they wanted the war to end and for all conscripts to return from the front. The following chronology takes its information from two main sources. The first is the Montenegrin daily newspaper Vijesti (“News”). This is the original source of almost all the news stories which have appeared in the Western press. Like most newspapers these days it has a web site: www.vijesti.cg.yu which contains all the main stories. It’s only in Serbo-Croat. The second is the web site “Free Serbia - other voices from Serbia” (http://www.xs4all.nl/~freeserb/e-index.html) which is produced by Serbian democratic oppositionists. They claim to have a Kruševac correspondent. Their accounts seem to tally pretty well with the accounts in Vijesti. The articles are available in Serbo-Croat and English. Bits of information have also been gleaned from Serbian newspapers which have web sites, notably Vreme (the well-known oppositionist weekly magazine from Belgrade) and Nezavisna Svetlost from Kragujevac. The media record of this movement seems to cease on 25 May. Does this mean it was completely crushed by state repression? Possibly… There is some information about the repression following the movement. Three reservists were sentenced to four years in jail by a military tribunal in Niš in early June. Later, another five were sentenced to three years. But discontent amongst conscripted soldiers flared up again after the NATO bombing. On Wednesday 23 June reservists from the 125th motorised brigade blocked the main road between Kruševac and Kraljevo as well as the Ibar bridge near Kraljevo. They were demanding the payment of their wages for the time spent in Kosovo. Around the same time another group of reservists blocked the same road at a different point. When senior army officers tried to visit the site they were pelted with beer bottles. About 50km away a few hundred reservists were blocking the Kragujevac-Belgrade road. The movement began to spread to other towns in central Serbia. After three days it was over, but only after generals had toured the soldiers blockades handing out wads of cash! A few days later 500 reservists from Raška launched a similar protest which ended on 2 July. The movement seemed to be centred on two towns in central Serbia: Kruševac and the much smaller Aleksandrovac, which are only about 20km apart. To a lesser extent it seems to have spread over a much wider region. The other towns definitely affected were: Raška, Prokuplje, Kraljevo, Baljevac, Vranje, Vrnjačka Banja. We can be sure there were others. It is hard to say if it had much of an impact on the working class in the rest of Serbia. Naturally, the official national Serbian media said very little about the main events of the movement, but could not avoid mentioning that desertion and anti-war demos had happened. The main political parties even made press statements about it. It’s certain that some people in Belgrade heard about it directly - from telephone calls from relatives and, more importantly, from soldiers returning from leave - but they were only a small minority of the population. It must not be forgotten that when the cycle of war began in Yugoslavia in 1991 central Serbia was a region where there were many collective revolts by conscript soldiers. The biggest, which involved 7000 reservists refusing to move from their army base, was in Kragujevac which is about 50km North West of Kruševac. It is also a region where there have been numerous strikes by industrial workers against the conditions of austerity brought about by war, including in munitions factories and other sectors of industry directly involved in war production. Throughout the almost continuous state of war which has existed in Serbia since 1991 there has always been a high level of draft-dodging and insubordination on the part of conscripts. This partly explains why Milošević has had to make so much use of mercenaries, local nationalist militias and gangster warlords (such as Arkan) for his military adventures, rather than the regular Yugoslav Army (VJ). It is also a major reason for the "neutral" position taken by the Montenegrin government during the NATO assault - according to a parliamentary resolution of June 1998, the Montenegrin state is obliged to prevent the use of Montenegrin territory by the VJ in the event of "military actions by the international community". The level of draft dodging in Montenegro has been even higher than in Serbia. In Nikšić in February 1999 around 600 men were called up over a few days , only 5 or 6 responded! Opposition to the VJ has often taken a very public form. In February 1999 the family of a soldier killed in Kosovo placed an announcement in Montenegro's largest circulation daily newspaper Pobjeda denouncing "failed politics" as "the reason that the Lazarević household is paying a bloody tax for the third time since 1991". It has to be said, though, that the neutrality policy of the Montenegrin state has been largely successful in neutralising opposition to the army - creating a situation where demonstrations against the VJ are simultaneously demonstrations in support of the Montenegrin government and its police. In Serbia too there was widespread opposition to conscription during the build-up to the start of NATO bombing. In interviews with opposition newspapers and radio stations many parents of reservists expressed their disgust for the mobilisation which was taking place. A parent from Kragujevac said: "Don't let Vuk Drašković, Vojislav Šešelj and the others incite war, we've had enough war, we are orphans. I call on all parents to revolt" (Radio B92, 18.3.99). In Leskovac (30km south of Niš) there was even some kind of protest by around 100 reservists refusing to go to war. Discontent was far more intense in central and southern Serbia for the simple reason that the military authorities knew that it was hard to conscript people in Belgrade and so weren't really trying. It is not possible to say if (or how much) draft-dodging declined when the NATO bombing started. There are conflicting reports and rumours, but it is clear that a significant percentage of the male population had no intention of answering the call-up. There was certainly desertion on an individual level. In an interview with Western journalists, a reservist described how he deserted from the Yugoslav Army in late April by swimming across a river into Bosnia. He said that when he was called up “I was surprised to learn that there were no more than two or three people in my unit who thought we should be fighting” (Guardian, 3.6.99). Despite the high level of resistance to the army over the last eight years it has mostly taken the form of a lifestyle choice rather than an organised movement and recent resistance seems to have been carried on in much the same way. The sustained collective refusals of conscripted soldiers and their families in central Serbia, however, express a real qualitative advance on this. At this point it is important to make a distinction between the proletarians who have taken direct action against the war effort and the attempt by some fraction of the bourgeoisie (Local? National? International? We can’t say for sure…) to recuperate the struggle by rallying the liberal petty bourgeoisie into the so-called Citizen’s Parliament created in Čačak (where there doesn’t seem to have been any real mobilisation against the war). Some of the Western Press (notably the Independent in the UK) have given a relatively large amount of space to coverage of this group. It is quite possible that if Serbia continues to be at war in some form and an anti-war movement develops again, or there is some kind of insurrectionary movement against the regime, groups like the Citizen’s Parliament will be presented as the semi-official leadership of the movement who express what it's really about. In this way the Western media, the Serbian liberal opposition, and the forces of the bourgeoisie in general, will try to divert this movement from its real proletarian terrain of direct action onto the bourgeois political path of demands for more democracy, less corruption, Drašković instead of Milošević etc. The "Alliance for Change" block of opposition parties in Serbia have begun to organise a series of mass rallies against the regime this summer, demanding Milošević's resignation and free and fair elections under OSCE supervision. It is no coincidence that the first one was in Čačak. Ten thousand people demonstrated in the main square. 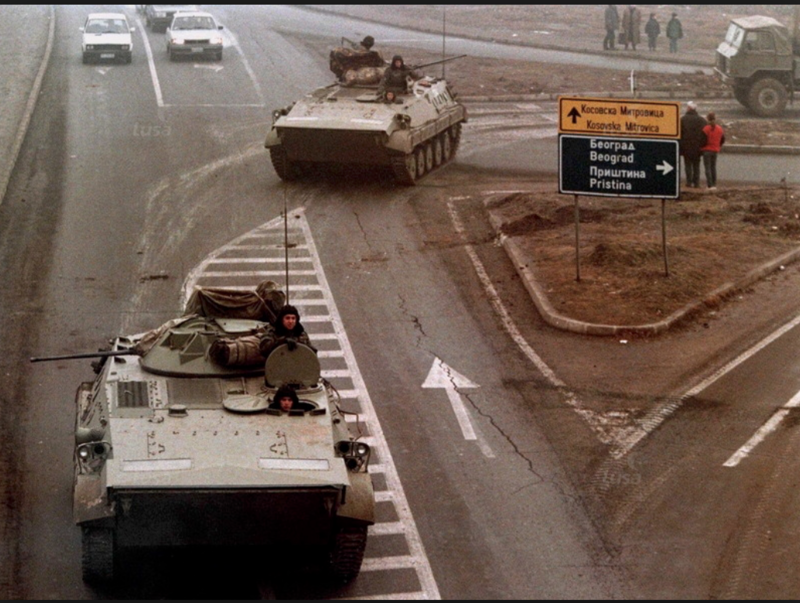 Significantly, the police tried to prevent protesters from reaching Čačak but the army supported it, providing army buses to bring protesters from Kragujevac. According to Vijesti, none of the opposition political parties were involved in the protests in Kruševac. Certainly none of them officially backed the movement. The nearest that the main opposition party, the SPO (Serbian Movement of Renewal), came to supporting it was a statement by their district committee in Kruševac that "Citizens of Kruševac are not protesting because their sons are defending Serbia but against the local politicians and profiteers". Just to make things clearer their leader Vuk Drašković later said: "We are not in opposition to Serbia; we are fighting for Serbia. Today we are fighters against NATO. Tomorrow we will be fighting against Milošević". Similarly, the liberal magazine Vreme, which everybody normally expects to take a very anti-Milošević line, condemned the Kruševac protesters for undermining national defence. But this doesn’t mean that the movement was inherently too radical to be recuperated. Even the most subversive actions of the proletariat, even armed insurrection and the mass slaughter of policemen (like in Hungary in 1956 or Iraq in 1991), can be claimed by the bourgeoisie as their own. We have to be clear that the kind of liberal democratic politics put forward by the Citizen’s Parliament has nothing in common with the proletarian direct action which has taken place in Kruševac and Aleksandrovac and, as always, is just as much its enemy as the air forces of Clinton and Blair and the military police of Milošević. While the respectable middle class citizens of the Citizen’s Parliament were writing a letter to Milošević calling on him to “save the lives of all citizens of Yugoslavia”, proletarians were saving their own lives by deserting from the front! The Citizen’s Parliament was created by the mayor of Čačak, while in Aleksandrovac the mayor was hospitalised by angry proletarians! Most of the conscripts and reservists from Čačak were serving in Montenegro and the Citizen’s Parliament called on them to obey military law. This has a double meaning: one the one hand, don’t get involved in an illegal coup on behalf of Milošević; on the other, don’t desert! Around a hundred people (mostly parents of soldiers in Kosovo) demonstrate in front of the town hall in Kruševac. They demand to know what has happened to their sons. Demo sparked off by the arrival of 7 dead soldiers on Friday 14.5.99. In accordance with emergency military laws, the names of dead soldiers are not being published. Two thousand people (mostly relatives of soldiers) demonstrate in Kruševac. They demanded to meet the municipal and military officials to find out about casualties in Kosovo. Some were carrying the death certificates of their soldier relatives. The mayor, Miloje Mihajlović, a member of the SPS (Serbian Socialist Party, Milošević’s party), was booed when he told the crowd he couldn’t help them. The crowd the smashed windows in the local TV station although it was protected by a strong squad of police. A thousand people were at the bus station in Aleksandrovac seeing off reservists who had just been home on leave before returning to Kosovo. “Someone spontaneously demanded that the soldiers shouldn’t go back there” (Vijesti) and the crowd stopped the bus from leaving. The mayor tried to appeal to the crowd but was knocked to the ground and kicked. The boss of the local SPS arrived but was also beaten despite having body guards. They were saved by a squad of military police who had arrived from Kruševac. The mayor was forced to hide in a shop toilet and ended up in hospital in Niš. The reservists eventually returned to Kosovo. Five thousand, mostly women, demonstrate in Kruševac. Windows smashed in municipal and military buildings, eggs thrown. Crowd break into local TV station. That night, more than a thousand reservists from Aleksandrovac and Kruševac desert from Kosovo. Commander of the VJ garrison in Kruševac accuses the protest organisers of “undermining the defence of the country” and “direct collaboration with the enemy”. When they say things like that about us we must be doing something right! “Citizen’s Parliament” created in Čačak by the mayor, Velimir Ilić. A hundred people (“educated and professional”) meet and call for an end to the bombing and the return of all refugees. Early morning, 1000 reservists camp in villages near Kruševac and Aleksandrovac. Noon, 400 reservists arrive in Aleksandrovac and say they will not go back to Kosovo. They parade along the main road “with automatic weapons raised” and then split up and go to their homes. Reservists from Kruševac still camped out. Commander of the Third Army, Nebojša Pavković, offers a compromise: absence from the front will be treated as a short holiday. The troops refuse, demanding an end to the war. Two busloads of reservists are supposed to go to Kosovo after being in Kruševac on leave. Only one bus goes. Reservists tell Vijesti reporters that the two-day demos in Kruševac were the main reason they deserted. They heard about them from other reservists returning from leave. They were particularly irritated by threats from the army command to prosecute civilians organising demos. "We managed to get home. There were many problems along the way. They even used water hoses to prevent us from going home. They demanded that we lay down our arms. We refused to obey. It was not enough that we were killed by bombs, now they are beating our parents. I shall not go back there. This is not a war, this is frenzy in which it is both difficult to survive and to remain sane. I want to keep my senses. I don't want to kill anyone, nor do I want to be killed..."
In Kruševac and Aleksandrovac the police arrested a large number of demonstrators (many of whom were women) A few were charged with public order offences and sentenced to 20-30 days prison with immediate effect. Police raid the home of the mayor of Čačak. He is not in and goes into hiding. Reservists have accepted the deal that their absence from the front is official leave. They hand in their arms to the military authorities (always a serious mistake!) and go to their homes. Protest in Kruševac by 300 reservists stationed near Kruševac for the last two months who are now told to go to Kosovo. They decide to refuse to go to Kosovo and demand that all remaining soldiers return. They demand that SPS members should feel the burden of the war, not just common people. General Pavković offers to give reservists permits allowing them to go home. Second meeting of Citizen’s Parliament in Čačak: 100 people meet in bomb shelter. Meeting approves a letter to Milošević calling on him to “save the lives of all citizens of Yugoslavia”. Most of the conscripts from the area are serving in Montenegro. The Citizen’s Parliament calls on them to obey military law. Protests calling for return of troops in Kraljevo, Raška and Baljevac. In Baljevac people carried placards saying “While one Serbia is in pain the other is singing”. The mayor organised a petition calling for the return of all soldiers in the next 48 hours. Reservists in Kruševac who deserted from Kosovo are called to assemble at the mobilisation point to rejoin their units - after the deal made with General Pavković they are being drafted again! The order is broadcast by the local TV station. A few hundred reservists based in villages around Kruševac have refused to replace those who deserted in Kosovo. Some of them hold a protest meeting in Kruševac and repeat that they won’t go. More than a thousand protest in Kruševac (mostly reservists and their relatives), demanding an end to the war and the immediate return of all troops from Kosovo. According to some people on the demo there are 1000 reservists camped out in the hills of Kopaonik who have deserted from Kosovo. Deserters first gathered at the mobilisation point at 7 a.m. Others joined them. Their were military police road blocks but no serious conflicts. Slogans: “Bring back our sons”, “We won’t go to Kosovo”, “We want peace”, “You won’t fool us anymore”. Police roadblocks prevent participation by reservists from villages outside Kruševac. Nobody from the local authority tried to speak to the crowd but a top army officer, “general Stojimirović from Niš”, appeared with a strong bodyguard around him. When the physically threatened him (dragging him and his guards down a side street) he said he agreed with their demands but that they should disperse and go home. There was a proposal to remain in the centre of Kruševac until the war is over and all soldiers have returned. People sit down next to the monument to the Kosovo heroes (of 1389) and waited for further news. Some people in Kruševac went to the military district HQ. An officer said that the order to return to Kosovo only applied to volunteers. The crowd shouted “enough lies” and “red bandits”. Despite all the protests there were also a lot of loyal troops and cops on the streets. Reservists from Aleksandrovac who had refused to go to Kosovo tried to go to Kruševac but were blocked by military police and loyal troops. They returned to Aleksandrovac and took part in a demonstration of more than a thousand people demanding the end of the war. Demos of some kind in Raška and Prokuplje. Police stop protest rally in Čačak. Citizen’s Parliament send letter to the president of Montenegro supporting his stand against Milošević and a letter to Milošević denouncing the government’s “adventurist policy based on the ideology of collective suicide”. A hundred people, mostly relatives of soldiers in Kosovo, demonstrate in Kruševac. Local military commander announces on local TV that reservists who carry on refusing to go can be prosecuted by the military courts. Any kind of gathering in a public place is banned for the duration of the bombing, violators of this ban will be prosecuted by the military courts. Some kind of demo in Prokuplje. Čačak: Seven members of Citizen’s Parliament arrested. Large group of people gathered in front of the court to applaud the accused. The class composition of the Citizen’s Parliament can clearly be seen from the professions of those arrested: 1 doctor, 2 university lecturers, 1 lawyer, 1 journalist, 2 entrepreneurs. A statement by the Citizen's Parliament said the kind of thing you would expect it to say: “No kind of repressive measure and force which the current regime uses towards the citizens will smother or crush the democratic consciousness and the citizen's desire for freedom”. Nothing is known about the whereabouts of the mayor, who founded the group. Kruševac sealed off by both military and civil police, not just the roads but also river barges and ferries.